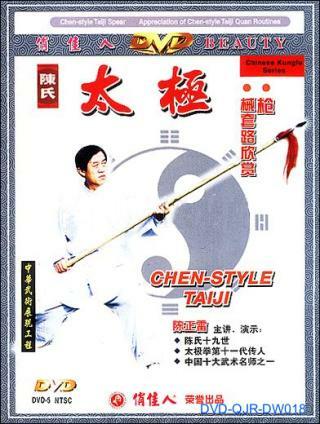 Chen-style Taiji Spear is also called Pear-spear plus White Ape Cudgel, which is one of the long weapons. It combines the characteristics of the spear and the cudgel. In real combat it has the effect of the spear thrusting in a line and the cudgel sweeping on a plain. With the use of Taiji Quan twining and sticking it is called Chen-style Taiji Spear. The routine of this spear is well knitted and cohesive with special features. Main movements are thrust, block, hold, parry, chop, sweep, twist and press. The play really embodies the magic and unimaginable power of Pear-spear plus White Ape Cudgel. The disc also includes demonstrations of Chen-style Taiji Quan New Frame 1 & 2 and Spring & Autumn Falchion.